The sign near the door simply says, “Smile”. The playful music begins, colorful animals start their up-and-down trot and the carousel ramps up to speed. I wonder, why does anyone need to be reminded to smile? 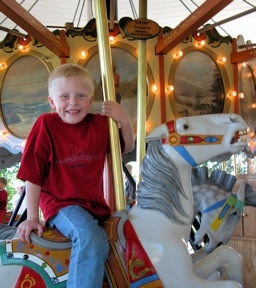 A smile seems as natural as breathing as we take our inaugural ride on the Carousel of Happiness in Nederland, Colorado. A menagerie of animals represent decades of carving by Scott Harrison. No two alike, each whimsical character embodies Harrison’s inspiration, devotion and talent. 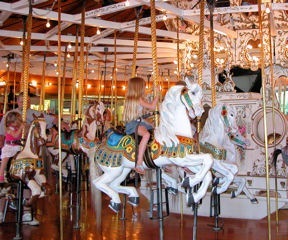 Horses dominate many carousels. Not the Carousel of Happiness, here we find a worldwide representation. 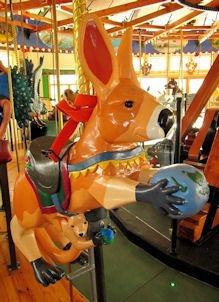 From down under a kangaroo with tiny Joey holds the whole world in it’s hands. A black and white panda represents China; an alpaca in ballet slippers comes from South America. From Africa there’s a zebra, camel, cheetah, long-necked giraffe and gorilla. A basket-like seat atop the elephant is the perfect spot for very young riders – would be maharajahs and maharanis. Of course, we note a lion and tiger and bear, oh my. From under the sea we identify a dolphin, fish and shapely mermaid. Animals native to the surrounding Rocky Mountains include a moose, lynx, coyote, a deer with real antlers and an Indian pony. Not overlooked are farm and domesticated animals – donkey, saddled pig, sheep, rabbit, St. Bernard, calico cat and a cow with real Swiss cow bell. Each animal deserves a closer look to appreciate the details, spirit and attitude carved into each one. Birds perch on the moose’s broad antlers and on the tip of the upturned elephant trunk. A mouse peeks out of the furry rabbit tail. A snake winds its way up the giraffe’s neck. We find it easy to understand why each carving took about six months. Not all carvings can be ridden. A baby orangutan clings to a brass pole. Looking up, a raccoon offering a flower bouquet elicits a smile and at the very top a girl twirls in free-spirited rapture. Smaller transformational figure carvings separate the Victorian outer running boards. Swans, frogs and a child evolve from eggs to celebration stature. At first glance the choice of which animal to ride seems daunting. I observe as both adults and children climb atop one, change their mind and switch to a second or third choice. The solution is as simple as a smile, ride several times. 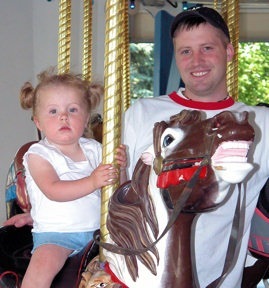 At $1 per ride – child or adult – this is affordable family fun. Enthusiasts can purchase a Carousel of Happiness Passport and keep track of each animal ridden. When they’ve made the “rounds” on all the animals they’ll receive a gift certificate for the adjacent shop. In addition to 25 moving animals several stationary animals welcome those wanting less motion to climb aboard. A bear in red galoshes leans over the back of a bench seat while a gorilla wraps his arm around a passenger in a padded chair or a wheelchair. There’s a choice for every ability and need. Age needs to be no consideration. Our family visit included four adults and one 11-year-old. The seventy-something had absolutely as much fun as the youthful granddaughter. 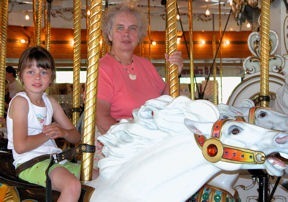 The staff told about a gentleman who came for a turn on the carousel on his 101 birthday. Now, there’s a goal I can adopt. The story behind the Carousel of Happiness is as meaningful as the experience is magical. As a Marine serving in Viet Nam in the 1960s Harrison found solace from a small music box sent by his sister. As he listened to the Chopin etude he dreamed of a carousel in a mountain meadow. 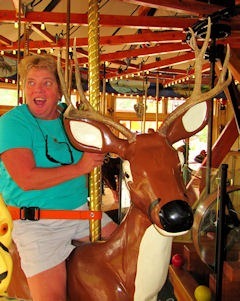 After moving to Nederland in the 1980s Harrison began carving carousel animals. Initially he used scrapes of lumber left over from constructing the family home. Soon he switched to basswood popular with craftsmen because of the ease of carving yet the durability of a hardwood. 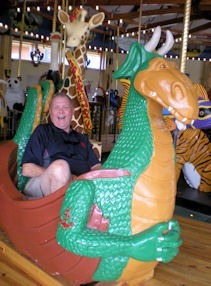 After completing several animals he heard of an antique carousel being dismantled in Utah. Built a century ago the carousel operated in Saltair Park on a pier at the Great Salt Lake from 1910 to 1959. With the demise of Saltair the carousel resided on the grounds of the Utah State Training School in American Fork for 27 years. In 1987 the animals carved by the famed carousel creator Charles I.D. Looff were sold to collectors. 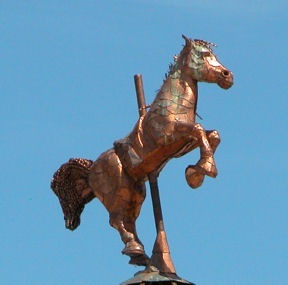 Harrison purchased the working parts and pieces of the stripped carousel and brought them to Colorado to begin the restoration process. 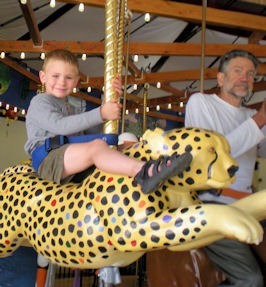 As a completed carousel came nearer to reality a non-profit organization was formed. The Nederland community came together in support of the project, raising funds for a building and offering volunteer construction labor. Volunteers continue in vital roles of the operating carousel. The Carousel of Happiness officially opened Memorial Day 2010. 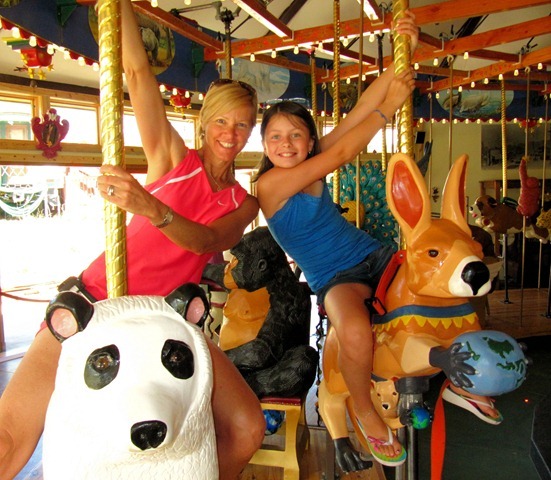 During the summer thousands have come for the classic carousel experience, leaving with youthful joy and broad smiles. 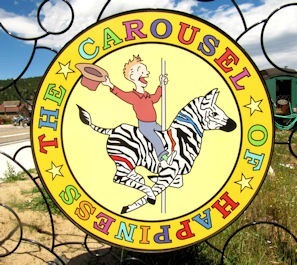 The Carousel of Happiness is located in the heart of Nederland at 20 Lakeview Drive, 303-258-3457. 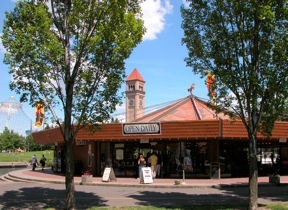 From Memorial Day to Labor Day the carousel is open daily 10am-8pm. After Labor Day it will open Monday, Thursday and Friday from noon-6pm, Saturday and Sunday 11am-6pm. There is also a gift shop and puppet theatre. The facility will open for birthday parties and private events. 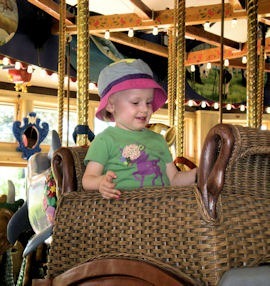 From the thrill of a toddler’s first ride to the nostalgia of senior citizens, carousels hold a magical place in our hearts. The menagerie of carved animals, elaborate painted ornamentation, bright lights and distinctive music set the scene for an enchanted excursion. 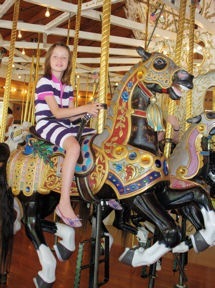 The Colorado Carousel Society encourages our whimsical journeys with a Ride Five promotion this summer. 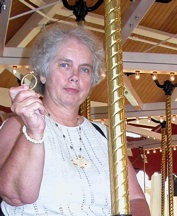 Between May 30 and Labor Day (September 7), 2009 participants will have a special coupon punched at each carousel they ride. After completing five qualified rides the punched coupon is mailed to the society to be entered into a drawing for prizes. Three of the five rides must be on antique carousels. Thousands of hand-car ved carousels operated across the country in the 1920s. Today fewer than 160 historic ones remain; six in Colorado, built between 1905 and 1928. The Denver Zoo is home to the contemporary Endangered Species Carousel with 48 hand-carved wooden animals – lions and tigers and bears, oh my! The Carousel of Happiness in Nederland plans to open before the end of 2009, sporting 36 newly carved animals on an antique 1910 Looff frame. unique animals include a moose, coyote, frog, alpaca, a flying pig and kangaroo with boxing gloves. A seated gorilla with outstretched arm waits to give a rider in a wheelchair a hug.Visiting this work in progress will qualify as a ride. 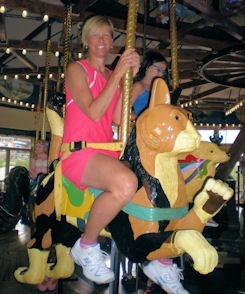 Three fiberglass reproduction carousels can also be found in Colorado. Ride 5 kicks off May 30th at Elitch Gardens. 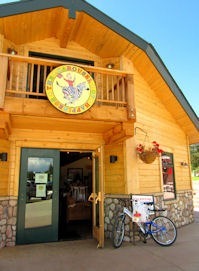 Participants can pick up coupons at the carousels or print them from the Colorado Carousel Society website. Each carousel will have a distinctive punch, completed coupons must be mailed by September 15 to be eligi ble for the prize drawing. 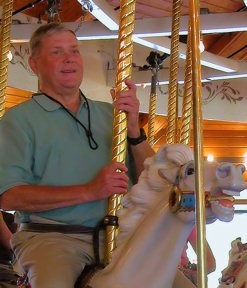 I plan to grab the brass ring this summer and Ride 5. Come along for the ride and join me?